In late 2015, a feature published on the Paulick Report detailed the story of retired jockey Gwen Jocson, who was diagnosed with neurological damage as a result of numerous head injuries suffered during her riding career. Jocson's story came just as mainstream media (and Hollywood) were facing the ugly reality that a degenerative brain disorder called Chronic Traumatic Encephalopathy (CTE) plagues an unknown percentage of football players, apparently the result of repeated concussions on the field. Jocson, who suffers from poor balance, partial deafness, vision problems, limited mobility, and weak short-term memory, had hoped by sharing her story, she could let other riders know repeated concussions can have real impacts. Given the seriousness of those symptoms, it never occurred to Jocson that her condition would not be officially recognized as a permanent and total disability. In 2016, the rider whose mounts earned more than $7 million was informed she had not qualified for assistance from the Permanently Disabled Jockeys Fund. On most days, Jocson's eyesight precludes her from reading. Her mother, Sadie Herndon, had to read the PDJF's letter to her. There's a lot the medical community still doesn't know about concussions and chronic head trauma. Doctors still don't know why some athletes end up with serious neurological conditions as a result of repeated traumas while others don't, and they don't know how long symptoms related to chronic traumas take to surface. It's also unknown how many people already have or can be expected to develop CTE, let alone how many jockeys have or will suffer from the condition. That question mark could be an enormous financial liability for a group like the Permanently Disabled Jockeys Fund. According to documents provided to Jocson by the PDJF, she is the first rider to request aid from the fund for a condition resulting from cumulative damage as opposed to a single catastrophic fall. “In prior instances the PDJF has awarded benefits to injured jockeys, the disabling medical condition such as paraplegia, quadriplegia, and brain damage has been associated with a single catastrophic on-track accident in which the injuries were immediately apparent,” said Nancy LaSala, president of the PDJF. To Jocson, the distinction doesn't seem very important. Her doctors have diagnosed her with the brain disease, superficial siderosis, due to multiple falls on the track, and they say she likely has CTE too. Currently, CTE can only be confirmed absolutely on autopsy, but Jocson isn't the first athlete who has been told by neurologists they're extremely likely to be suffering from the condition. Jocson and Herndon are told neither of these conditions are reversible; whatever time the rider has left will be spent managing her symptoms. Jocson still falls often due to her lack of balance and sleeps on the floor to avoid falling when getting out of bed. She crawls around her house when she's alone and works with therapists and psychiatrists to improve mobility, balance, and sleep. She doesn't expect she'll be able to drive much longer. In the midst of all this, her bills are piling up. Herndon has taken over managing her daughter's bills and successfully enrolled Jocson in Medicare, but it's not retroactive for the expenses she incurred before her enrollment. Herndon makes a project of calling around to charities near her home in South Carolina to see if anyone is able to provide Jocson some help. Neurologic disorders are expensive, and Jocson suspects that could be at the heart of the PDJF's rejection of her application for assistance; she believes the fund is unable to open the door for other riders like her to request assistance. The National Football League has been accused of wiggling out of responsibility under league insurance in disability claims related to head trauma. Whether the league is unwilling to open itself to financial load by admitting head trauma can be disabling, or concerned about additional liability outside the scope of its insurance plan, is anyone's guess. The PDJF disagrees with Jocson's viewpoint on their motives for her rejection. In a letter to Jocson dated Oct. 15, 2016, LaSala indicated the PDJF had questions as to the degree of Jocson's disability. 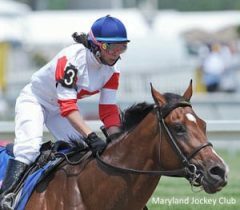 After all, Jocson did participate in a Lady Legends charity race at Pimlico in 2010, 10 years after she retired from riding. Jocson told the Paulick Report in late 2015 videos of her performance in the race make it clear to her that her coordination and balance had begun deteriorating at that point. The progression of her symptoms escalated in the years after the race. Dr. Irwin Lifrak, an attorney and physician who has consulted with Jocson on her application to the PDJF, said it can be difficult to pin down exactly what constitutes “disability.” Whether or not someone is employable depends not only on their physical and mental health, but their skillset and the availability of an appropriate job in their geographic area. Lifrak said he has sympathy with the PDJF's situation and wouldn't blame the group if the rationale for Jocson's rejection had been the nature of her condition. Still, LaSala said the fund has not and will not deny an applicant assistance based on the condition causing their disability. That doesn't mean the fund is necessarily prepared to deal with a significant influx of riders suffering from total permanent injury from CTE, should that occur in the coming years. Since the PDJF's foundation in 2006, LaSala said she and the fund's board have been aware of the enormity of the costs associated with supporting a disabled rider, especially one with ongoing medical needs. Although some racetracks have paid into the fund routinely, others do not support it, and PDJF has been unable to raise the monthly stipend amount of $1,000 for the 60 riders it supports. Recipients of the fund's stipend say it has made the difference in some cases between paying and not paying their rent. Overall though, any notion of the sport supporting its own injured riders completely has never been a realistic one. According to one workers' compensation insurance expert, many jockeys are riding in states with limits on the total amount an injured worker may claim after a catastrophic accident. In most cases, that limit is $1 million. “One million dollars won't get them out of the hospital,” said Brad McKinzie, who helped engineer California's self-insurance group for the state's riders and backstretch workers. McKinzie said the most expensive claim in the state for 2016 will be about $6 million to $7 million and is from an exercise rider who suffered neurological damage when a horse flipped. Even with help, jockeys are left with a long, tough road ahead after a debilitating injury, whether it's suffered in one fall or a dozen. It's a question that troubles Jocson because almost every exercise rider or jockey has suffered a concussion in his or her career. Jocson estimates she sustained at least 20 of them. There's little hope of eliminating head trauma from the equation when the job requires galloping horses at 35 miles per hour with the rider's head about eight feet off the ground. If Jocson is not considered totally and permanently disabled, she said, maybe she can still be a cautionary tale to young riders, who are cutting school like she once did, to spend more time in the saddle. This entry was posted in NL Article, Ray's Paddock and tagged concussion, Concussion In Sport, cte, gwen jocson, jockey head injury, jockey injuries, Jockeys, nancy lasala, pdjf by Natalie Voss. Bookmark the permalink.